iam finished with the print of the machine vise. Unfortunately, my 2x base parts arent looking that good on one side. See screenshot. Where do these lines come from? It is not the Z-Line, because the front surface of the part was on the heatbed itself. Others do have also these isssues and they dont know why. I used Slic3r PE as slicing software. Would be great, if someone experienced this kind of problem and solved it :). Was there some warping during the print ? Warping can change the geometry of a piece. Also it seems that the lines are just on a left side. So it let me think that there was a warping issue just on the left side. I am printing this as I type. Can't wait to see how it goes together. Had to print the main gears at 105% x and y. The main jaw needed a bunch of sanding to fit. I think the clearances are for a better setup than mine. It's still sticky at certain points. That said, I love the concept and it's functional. The threaded rods are a bit fragile when printed vertically. They can break at the base easily. I printed the main jaw 3 times because I'm clumsy. Ender 3. Hatchbox PLA. 190 c filament and 30c bed. 50 mm/s speed. this is not "yet another machine vise", this is The King of Vise! The assembly was perfect, the movements are very very smooth! amazing design and the assembly animation is super cool !! I printed mine 9 months ago (April 2018). It has proven to be THE most useful thing I have printed so far. I use it frequently for soldering jobs (been doing a lot of that lately) and it is holding up very well. Mine assembled fine with no issues. I ran a 12mm tap along the threaded portions to smooth them out a bit; it worked okay off the printer, but the tolerances were pretty tight. After cleaning up the threads, the movement is much smoother. I just wanted to share that and give thanks for a great design! Thanks TheGoofy for that well constructed device! The thread seems to be metric. But it is no locomotor thread. It would be better to use a trapezoid thread. So you have a bigger pitch and don't need to spin so often the knurled screw for same translational movment. My main issue is that the clips are loose and don't actually hold the sides together at all. Any suggestions on how I should reprint them to make them actually tight? the assembly video is so cool! great work guys. I wish all assemblies had this! However, would you consider reducing the size of the 2 gears so that the vice can lay flat on its side? This way it is possible to use it in a 90 degrees angle on a bench drill. Also the same goes for the bottom of the vice (The non-moving jaw side) . If you can make it totally flat it also can be used in that direction. To print it correctly in ABS i had to build house for my printer. Tried different temperatures, but sliding jaw threaded rods always brake if printed verticaly. I printed separately them in horizontal and attached to plate with metal screws(super glue to keep it tight). Worked grate and now they don't brake anymore. Base A and B in 0,3 rez, everything else in 0,2 with 80% infill. Clips reduced to 94% to fit nicely. Now its very tough and solid vise. Ender 3 without cooling, 260 c, no support worked nicely. Fantastic design. Printed with super, super tight tolerances for me. I had to spend a couple hours filing down parts to get them to fit correctly. However, I have a feeling I just need to tweak my brand new Taz6 a little more. Well done! While I can't complain about it many of the 3D designs that I use from other people need to be redesigned to easily print or work after being printed. It's good to see someone illustrating the subject with a functional example. And I also need a bench vise. Thank you for sharing the F3D file and for the excellent video explaining the mechanical aspects of the design. Excellent design .I even need no supports to print it,that's so good! I need to print the clips with 95% in Z and Y to fit into the slot. The other parts printed without any problems. I did insert a piece of filament between the slot and the clip on the small side to prevent moving of the clip end. Fits perfectly. Stop the print always here, why? Thank you for the file, the original sliding jaw threaded rods failed for me but your horizontal rods worked perfectly. I used PETG for the rods and sliding block, PLA for everything else. Tried priting it twice following recommendations, but no chooch either time. Something going on with the sliding jaw and the threaded rods, tolerances are too tight and its impossible to move once installed. Looks like a lovely build but I fear I won't be putting down any more plastic in attempts. 12 X1.75 tap and die will likely clear up the issues. I needed to do that with mine. The threaded rods broke when trying to get the gears on. Too tight fit, would only get half way in. Had printed at 0.2 BTW, so my fault.. Now sizing gears 102% in X+Y direction. One question on the threads, if they are a bit tight, the stress is in the wrong direction, twisting the rods off the base. The stress is rotational, so a better design is (like the remix) with flat rods. I too have the same problem, only thing is i have printed the gears and rods in 0.1. I also cant get the body to work. everything is supersnugg and wont turn. I have no idea what im doing wrong. Printed in pla btw. I've tried to print horizontal threads (like in the remix) as single piece, but the quality of the slightly overhanging threads was still an issue, and it didn't fit with the bolts. So I split them in two halves. This is a very beautiful design I really want to make one. But there is a problem my printer isn’t that big. So I decided to make two separate parts from one base plate with a bolted connection as you can see it in the attached picture. I thought that I have to make the base all over again it took me a long time before it was done many respect to theGoofy who did the original design. Later on I discovered the Fusion File with all the parts. But then again I have learned a lot from this project. I'm having the same problem. Could you please provide me the file or make your design a remix? I printed this at 80% so it would fit on my Monoprice MP Select Mini. I also used the alternate sliding jaw (https://www.thingiverse.com/thing:2123529). very good design and nice result ! What a simple, yet brilliantly elegant solution! I can't get the main gear to print correct. I'm using a TAZ 6 printing in ABS. All of the other parts print but the outer part of the gear is a mess. I reduced printing speed, lowered temp, and played around with the border thickness. I reprinted just the gears and screws in colorfabb NGEN and wow what a difference! Oh my gosh. this project snapped together perfectly. what an incredibly well designed tool this is. i cant imagine how much time must have gone into designing this. What tolerance do it have? Thank you for the very helpful video on the material properties of printed plastics. To increase tension strength of a screw you could epoxy a horizontally printed support piece down the middle of the screw. Sort of like rebar in concrete. Im trying to get this thing fixed. But i cant get de gear on it. It is to tight. I printed a few little bit bigger. than the gear fits on the threads but the ratio is not good any more. so in the the pic you have just 2 of base B so what is base A for? Base A and B are symmetrical (mirrored), but I've updated the model with some sort of tab and slot for better alignment. So the parts are now different. No, both of them. A and B fit together. They are right and left parts. a really well designed little vise! sliced with e3d and it printed great. the vise really works and i wish i could design things as good as you. First, brilliant work. I am impressed. I am thinking of making one of these, But thinking of replacing the Sliding jaw threads with metal threads, that just screw into the Plate (currently attached to the threads). What is the diameter? should i take anything else into account - maybe pitch of the thread? i put 4 rubber legs on the bottom so it will not move while soldering works. Hello just almost finished all Parts. Perfect Design but I have one question since the plates are replaceable can you share the 3D Objekt files so I can modify costomise the plates? Also the handle would be nice since my printer is messing up the overhang part all the time. Thank you!!! Your design is amazing. Every part prints perfectly with just the right tolerance for a tight fit and smooth movement. I hope I can teach myself to create such good working designs. Thank you very much for generously sharing this fantastic design. I will post my vice in the makes section when there is some good light to get some decent pictures. Thank you for the well thought out video and relevant data. I thought this might be of interest to you... I just watched this video by Thomas Sanladerer, where he does some initial testing with materials strength and stiffness after annealing a few different plastics including PLA. Albeit there was some shrinkage/expansion, he obtained about 40% increase in strength and 25% in stiffness after baking plain PLA for 1 hour at 110*C. He covers his methodology and shows snapshots of the tests. I love it. Made on a Prusa i3 MK2S. Great design. I had no issues with gears and I user slicer for mk2s. Everything was printer at 100%. I popped the large pin off the front and have it pinned and glued. Gorilla glue gel works the bet so far. You did a great job on your PLA stress video! Wow, excellent work! The vise didn't work out for me due to issues described by others with the gears but I did find another way to enjoy your vise. I had a lot of fun with my print. Perhaps this video will inspire you for future stress test videos. Turn the piece diagonal (rotate 45 degrees). That's what I had to do. Has anyone had success printing this on a printrbot simple? I've tried a few times but my gears never fit right. Any chance someone can use calipers to get measurements on the threads so I can tell what part of the print is off? Thanks! Great video, great work. Thanks for sharing. I just printed the parts, but the sizes are not correct on my print, now i know this is not a design problem, but i want to know, does anyone can help me with my settings?? im using craftware to slice. I built one today and it's amazing! What a great design. Thanks very much. A possible modification to great design is to have pegs or holes on the bottom to stop it moving on a table. Here, here! Would be a nice, functional addition. That's a great idea! I'd love to be able to bolt this to my drill press. I agree with 104% XY on main gear. Everything else printed as-is, but I'm only using 1.5 'pins' to hold the two halves together. Awesome design! I made one and the main body parts felt rock solid and fit together nicely. I don't think I've ever had this much success with a multi-part build before. I'm printing in PLA on a Printrbot. I did have to print the main gears at 103% XY keeping Z at 100% and there was a little bit of filing and oiling. Bit, I am impressed! Great design. Great Video. Thanks for the effort. Thank you for this design, it is excellent. I did have to oversize a little the main gears by 4% on the X and Y axis because they would have too much friction on the screws initially. Excellent design, thanks for sharing. The idea of interchangeable custom clamping plates is particularly good. Any chance you could provide a step or parasolid of your original designs for these parts, it would save a lot of time for anybody wanting to make their own designs. That would be much appreciated. This should not be called "Yet another machine vice". It should be called "The best machine ever". It printed perfectly. Fit together perfectly with a minimum of cleanup with the minor exception of the holes for the base clip pins which were a little tight. And best of all it works great. Thanks for the project and the great video. I am constantly amazed at the generosity of contributors. Excellent design. Just printed. Everything went smoothly. Thank you for sharing this and also for sharing your knowhow in the video. Thank you.... for me, it's one of the best working pieces in thingiverse. Great job ! Awesome video and very nicely explained. Thanks, I'll make one! I'm having problems with to tight clearances, I use PLA, Cura and a wanhoo i3, 0.2 thickness for gear and sliding jaw, and 0.3 for the rest. the slider sticks to the base and wont slide, the gears sticks on the rods if I can get them on, and I don't need the pins since the base parts sticks hard to each other. Any hints on what I'm doing wrong? do I need to post process the parts? Excellent! I love it!! This has to be on the top of the list for proper clearances for moving parts and functionality. Excellent video and project TheGoofy. But please explain why you used two different printers? And would you be willing to share this in Fusion360? Because I have two printers, I let them both work - it's quicker. The link for the Fusion 360 file is in the description. I'm curious about the manufacturing quality from the two printers. I have a MakerBot Z18. Did you find either printer more suited to printing particular components than the other? How would you compare the ease of use of the software and devices themselves, and the output quality? Would you recommend one printer over another since they're both FDM/FFF? Actually I prefer the UM, because of the lighter print-head (less vibration), and the illumination (maintenance work). Extremely important are rigid frame and guides with low play and friction. I'd wish both of my printers were a bit better from this aspect. Thanks for sharing your Fusion360 file Goofy. My son will show this in his Design & Technology class at school. Great design. Printed up perfectly with PLA on a Prusa mk 2. I am having an amusing problem with vise_sliding_jaw_plate where the printer seems to just shift the x axis over a bit when it gets near the top layers. It only happened with that part. I moved on and printed the sliding jaw no problem, so it's not the printer. I figured I had a bad .gcode file so I re-scliced it in slic3r and the exact same thing happened on what looks to be the same layer. Strange. I think I found a bug in slic3r. Thankfully it gets close enough to the end that the part is usable so no harm. How weird! I just printed it on my MK2 and EXACTLY the same thing happened to me. I turned that one part sideways and it then printed fine. Hope that works for you too. Protip: I had trouble with the drive gear slipping on the 2 "main gears." Scaled the "main gears" in x and y 103% (not z) and it works perfectly. Nice. Thanks for this post. I was just starting my 102% main gear attempt (during which I thought "should I be scaling the Z?" and after my 101% print) when I came up and read this comment while looking for the thread size. I went back down, cancelled the print and reset to these XY 1.03 settings. I have high hopes! Thanks again. -joe PS I'm still going to order an M12 tap, just in case! Yeah I'm having the same issue. Probably gonna do exactly as you said... if I can get the thing back apart. Excellent construction, went on my to-be-printed list! Have you ever tested how much pressing force the vise would stand? I do not have a specific needs, just for curiosity. On basis of your force experiments video it could be some 30-40kg? Awesome work! Well designed and could be printed without any troubles. I love the clips. Thank you! With ABS it did need a lot of sandpaper work on the rods and the slider but now it works perfectly. Since you have an account, there should be a create button to the left of the search bar, then choose upload a thing. Once you do that, it should show you what you need to do for each part. Happy posting! very nice work, I like it very much. For 3D Printing normaly holes are too small and rods are too big. third reason is the contraction of the polymer itself while cooling (PLA different than ABS). Normaly this things are no problem because you can machining holes and rods after printing, holes very easy by drilling. But do you design the parts with this knowledge of this three reasons? (Except the first one because you could not know). I think one of the big problems, when scaling down a model are thinn walls. If these walls become thinner than 2 traces with the nozzle, then the quality of the print gets really bad. When I'm creating a design, I'll check that none of the thinn walls are smaller than 0.8 mm (2 x 0.4mm nozzle diameter). I think the vise has such problematic regions around the holes for the pins. This means downscaling is only possible, when printing with a smaller nozzle. Or when somebody wants to print the vise with a 0.6mm nozzle, he won't be able to get a clean nice print, unless he scales it up to 150%. thanks for your very generous answer. At first, yes you are right the thin wall problematic is the main problem with scaling. I did not mean exact your STL file. I meant the STL Format itself where holes were discribed as a function out of triangeles. I think big holes like the thread in 12mm are not problematical but holes with diameter of 2, 3 or 4 mm are mostly much smaller as in the design. In the internet there are tables available where for a defined real diameter a diameter is given for how you have to design the hole in CAD to reached the defined diameter. But your are definitly right and I am on your side if you say in CAD you design the part in a perfect fit and compensate in the slicer if neccesary. That is a good approche because the 3D model should be perfect without any compensation because then you can mill it out of metal or other materials. Yes I'm aware of the triangles in the STL-file-format. Fusion 360 does a good job, when exporting STL: there are quality parameters to adjust the maximum deviation from the ideal surface. Depending on the object shape, it will generate smaller triangles in order to meet the quality requirements. The STL-format is certainly not ideal, but its simplicity is unbeatable. Ok I am a beginner in designing in CAD, in real life I am a chemist so I am only a amateur in this topic. I can follow you and I did not know that Fusion 360 has this options. I use Freecad for designing simple obejcts. Perhaps I will switch to Fusion. I don't know. I am a beginner and have no mechanical background. So I can't judge about FreeCAD or Fusion. I don't know any function of FreeCAD where you can select the quality of the STL export. What I said I am a beginner and don't know all, but able to learn. Thanks for your sufficient help. Anyone having this issue when printing with ABS. I cant screw the gears on its too tight. Does anyone know if there a similar setting in S3D? An overheating stepper driver chip can cause that. If your set screws / belts all look good, then check your electronics board. Make sure your electronics are getting plenty of air flow, and consider putting heatsinks on the stepper drivers. Check the set screws on the gears attached to your stepper motors. I had the same thing happening and that was my problem. The shaft was spinning loosely inside of the gear, so it would shift the print. Ok. But do you know why that would start happening so late into the print? I other words, why did it print so much of it before having this happen? The same thing would happen to me. 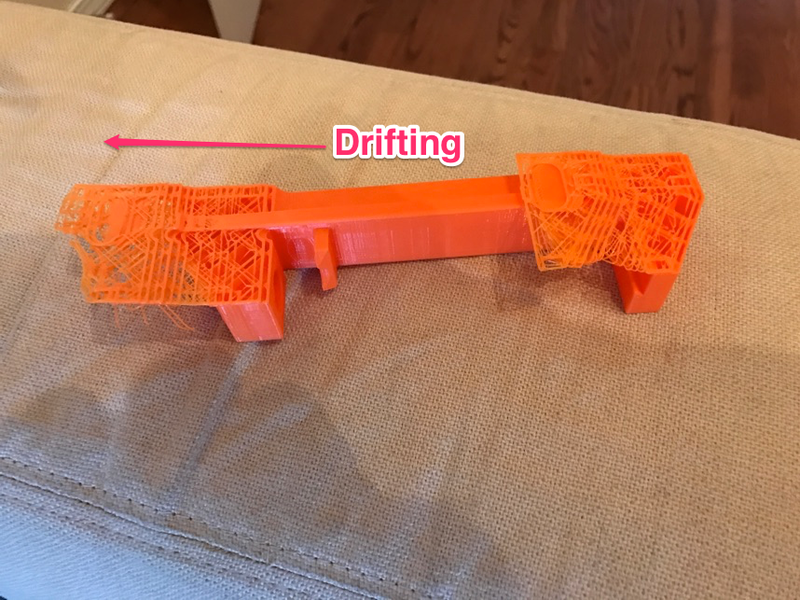 I guess that the there may be enough friction between the stepper motor shaft and the gear to print some of the print but then it hits a point where it breaks loose and that's when the shifting occurs. I had prints that looked great on the top and bottom but shifted in the middle. I guess the acceleration (or speed) for the travel moves is too high. Hey, did you tried it ? i would also like to print it something like 70%, it works ? Did you try turning the base pieces 45%? Straight they didn't fit on my Taz Mini either, but after turning them 45%, they fit just fine. Thanks! I'm using the horizontal rods and at 70% everything is still silky smooth, going to pop in some different colored filaments tomorrow and finish it up! I printed the yellow threaded part but my threads look thin and uneven. Is there a way to upload a picture so that I can show what I mean? The red knobs would only thread on the width of the knob before binding up. Very good design! I could imagine to use it on a cnc router. The advantage is that it will lower the risk of crashing the endmill into raw steel. For this purpose the vise still needs two latches to clamp it on the mills bed. I am really impressed how this whole thing comes together without glue or screws! How many test prints did you make until you got everything fit so nicely? I printed on a Lulzbot Taz Mini, and some pieces were a bit tight. I had to file down the two surfaces of the sliding piece as is was binding on the base pieces, and I reduced the thickness of the clips to 2.4mm to get them to fit through the slots. did anyone tried to upscale it? Very well thought out. Nice job! Great Design! I just started to print it. Hey, I printed it yesterday but The Main gear does not yet assemble with the rod even though i printed the main gear with 0.1mm layer height. Can I use a M12 Thread cutter to make it working ? Yes, this will work - it's a regular M12 thread. Alternatively, you could try with different print settings (obviously the printed traces are too wide). Try to reduce the material flow, or specify a larger nozzle diameter than your printer actually has. This looks really good, I am looking forward to printing it. Just one question, what is the biggest PCB that can be held in this vise? The distance between open jaws is 68 mm. If I can make a suggestion. Perhaps it is just my inexperience, but I print in PLA on a heated bed 60C. I have a hard time getting pieces off the print bed when they have a large surface area in contact with the bed. So I started chamfering the edges of my designs and that has made it easier to get a spatula in to pry off the piece. Am I doing something wrong with my printing method? I am worried about printing the base plates for this reason. I would highly suggest switching to a PEI build surface. No glue / no prep ever again, if you get the settings right prints pop right off with the correct amount of adhesion. Only suggestion is to do a couple test prints and start with the heat low then work your way up. I've used this build surface on aluminium and borosilcate glass. All I do is wipe it off with rubbing alcohol and go again no mess. I print on a heated bed with blue tape. When the bed cools, the prints come off pretty easily. One note, with a heated bed and blue tape, DO NOT USE ALCOHOL or it will be very difficult to remove. The heated bed makes the tape tacky enough that you don't need the alcohol. I print on a 70c bed. That EZ Snap is great, but many people need a 102.5% sizing to get the blade to fit. I used to use the EZ Snap to make a gap to get larger scraper in. Now I use PrintBite (like PEI but different) and just lift off the parts when the bed is cool. Hi friend, you project is amazing! I dont have many expertise in 3d design but i would like to ask an thing to you. 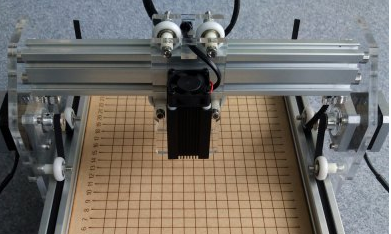 You don´t have the interesting to create a very similar mechanism to laser engraver machines. Today the big problem with this machines is the adjust of focus, because is very small and imprecise. If we have a method to adjust entire laser module head will help me and another thousand of peoples. Excellent video. One little idea: if you change the orientation of the dovetail joint then the plate will pull the jaw parts together instead of pushing them apart. That's true, but then the two base parts couldn't be printed without support material. Love it! How good of printer do you have to have to print screws like that? Just picked up my first printer today have yet to print! A used Lulzbot AO-101. thanks for sharing. you are one of thingiveses greatest. thanks! What video did you use for reference when making gears in Fusion 360? I do know that when I print threaded rods horizontally flat on the bed rather than vertically they feel a WHOLE lot stronger...but require tons of support. Would a remix with a threaded hole on the slider (where the rod can be glued in) and printed horizontally be better? such as this remix for a different PCB vice? It's an excellent idea to print the bolts horizontally with some flat area for avoiding support material. Small overhanging thread tips (teeth) are still a problem for 3d-printing even if it's only 30°. But if the bolts are split in two halves, there are no overhangs at all! The standard M12 threads have a 1.75mm pitch - that's at the limit for a 0.4mm nozzle. I recommend to design some screw with 2mm pitch (e.g. M16). Nice design and great instructions. The failure mode analysis was very insightful, thanks! Clearances look to be around .2mm. Your print accuracy must be very good. Love the clips for holding the two halves together. I have trouble printing 60° threads. I'm playing around with buttress threads to see if that's easier. Excellent! I'll print it and let you know. Thank you. I'm printing with UM2 and R2x. For some strange reasons threads are better on the UM2 even with the same type of material. Are you printing with ABS? For the threads I recommend either PETG or PLA - with ABS this horribly fails. The small pins are too large and doesn't fit the vise. I had to change them to make them fit. I feel that everything is too tight, I had to sand down many of the parts so they'll fit. I've assembled a lot of multi-part objects with tight clearances, but this one was very tight. I had to scale the clips to 98% in all bit length, had to do a fair bit of filing of the slider block, and both file the handle and drive with a drill to wear it down a bit. It's all working well now but could do with a fraction of a mm more clearance in a few places. The clips for instance don't need to be a tight fit in the hole to do the job. Different printers are differently accurate. Especially the rippled vertical surfaces (due to layers) can be very different. There are various options to tune this and potentially avoid sanding. 3) in "Simplify3D" under "process settings / other" use a negative "horizontal size compensation"
I recommend to test-print a cylinder with well known dimensions, while tuning these print settings, and check the printed size with the callipers. Do you think its scaleable? I only can print 120mm cubed. This is such a great design, I also really enjoyed the YT video where you explain how it was made. Definitely printing this as soon as my printers have some free time. The swappable jaws is a really useful feature as well. What is the thread detail? M12 x 1.75? I want to run a die over the threads to dress them up. Thanks. Yes, M12 x 1.75 is correct. Delete my previous comment. I see how it works now. I can't delete it, but only "flag". Then the Thingiverse Admin will have a look at it ... I guess you should be able to edit and delete your own comments. Both of the threaded rods are right hand threads. Also, the main gears. When the center gear is turned, the main gears go in opposite directions and the vice jams. Am I doing something wrong here? It seems like one of the rods should have left hand threads along with it's gear. Err, the two outer gears go in opposite directions to the knob, so in the same direction as each other. I have the same problem. Is anyone else actually trying to turn this thing, or am I just completely off? All orientations of threads and gears are correct. There must be another reason if it jams. Did you test that everything slides smoothly? Do the threaded rods slide properly through the holes of the base? Has anyone modded this to add table mounting points? make the soft jaws identical, only have them use a central lock of some sort (pin, snap, whatever). You already have good central access on the stationary and movable jaw so the lock hole could be through for easy change, or 3d printed fastener/clip. Please, a "blank" jaw file in step or X_T parasolid format so ppl can model their own clamp profiles. Screw shafts with 45 degree buttress threads with the 7 degree face up (towards the gears). Wow, very nice design and a very good video on design issues and principles. I'd love to see more of these!! Thanks for sharing! Great design and I love the video. What infill percentage would you recommend? Very nice design and thorough explanations. Well done! Any chance of also uploading a Fusion360 archive of the design? Especially of the jaw protectors so they can be easily modified? Fully understand if you prefer not to, though. Just thought I'd ask. Thank you, sir! Greatly appreciated. Another Masterpiece from TheGoofy. Thank you for sharing. Looks like a great tool for holding boards in place for soldering! Another great design with a clear and interesting explanation! Thank you TheGoofy for sharing your work and knowledge with the community. What are the recommended resolutions for the various parts? Can they all be printed at .2mm, or should the threaded bolts be printed at .1mm? What is the diameter of your hotend nozzle hole? I've had same idea for my next bench vise, but made of steel ;) thanks for sharing. I also had an idea how about you don't comment!